I love this! And the Frances Lockie quote is just perfect! This is my favorite post that you have written. I have decided just recently that I am done worrying about weight. 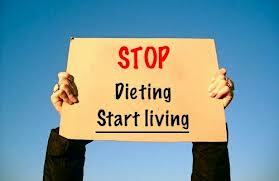 I am aware of the magic trick that makes you lose weight….diet and exercise. I love cooking good food, and I want to be able to eat it too. I want to be healthy, but frankly I have a lot more fun things to do than hang out at the gym every day after work. So kudos to you for choosing healthy and happy! Thank you, Meagan 🙂 Enjoying good food is one of the great pleasures of life. We’re not really living if we’re always depriving ourselves, are we?